With the best intentions in the world, Sony recently opened up a competition called Bid For Greatness, which would let PS3 users compete to get hold of some props and costumes used in the company's recent "Greatness" commercial. There seems to be a problem, though, and it lies in Sony's execution. See, each item is going up for "bidding", with the winner being the person who "bets" the most gold trophies (you don't actually lose the trophies, you just can't use them again for another bid on another item). 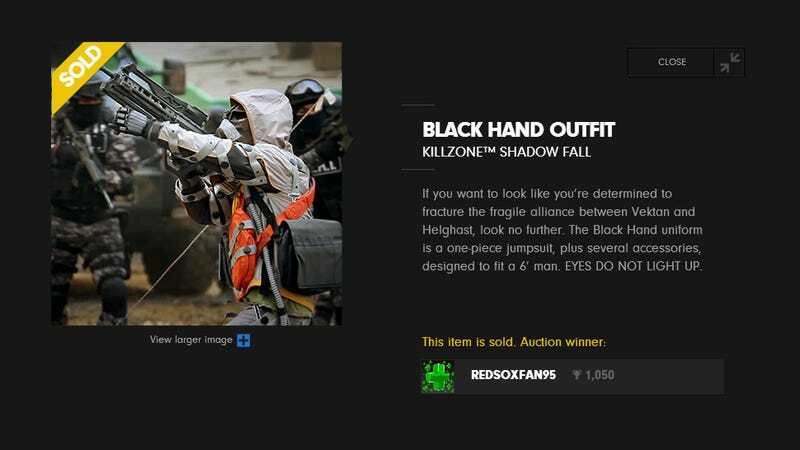 The first item, a costume from Killzone, was won by a user called REDSOXFAN95. Who has promptly been accused of cheating. See, like most online leaderboards, Sony's trophies have long been vulnerable to hacking and exploits. And when PSN Profiles took a look at REDSOXFAN95's trophy history, they quickly accused him of using "illegitimate methods to obtain trophies". A look at his PSN profile shows why some have grounds for suspicion. According to the profile page on Your Gamer Cards, REDSOXFAN95 somehow managed to rack up over 8000 trophies between mid-November 2012 and January 2, 2013. Interesting. Could be a glitch in the system, but then, it could also be the first of many items being claimed by those who have cheated their way to a sizable trophy collection. We've contacted Sony for comment, and will update if we hear back.